SCRABBLE is taking the world by storm. It's everywhere. You can play it on Facebook, iPhone, iPod, Nintendo DS, PSP, mobile phones... you name it, it's there. 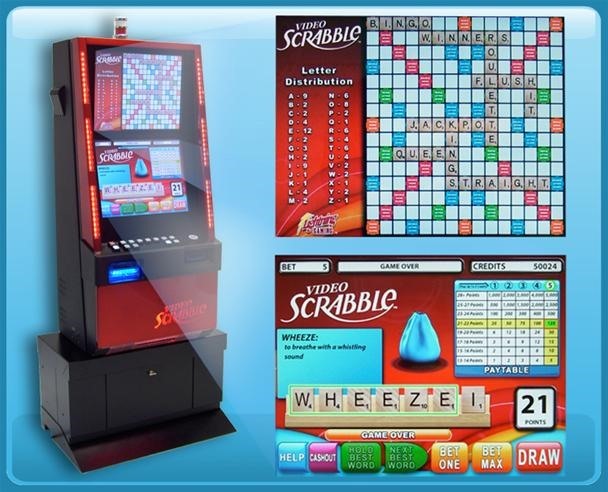 And you can even gamble online, like with SCRABBLE Cubes on WorldWinner. But now SCRABBLE gambling has a new face and place -- Video SCRABBLE, coming to a casino near you. Sounds great, right? Except, there's no real skill involved here. You don't use your own brain to come up with words; the video "slot" machine does all the thinking for you. In order to win, you have to find the highest possible word score according to SCRABBLE's scoring system. You bet and draw a round of letters, it automatically highlights the highest scoring word for you to hold (if you choose to), you draw again and it redetermines the highest scoring possibility, then you win based on the pay table. You can also earn a Bonus Round based on the Bonus Meter. 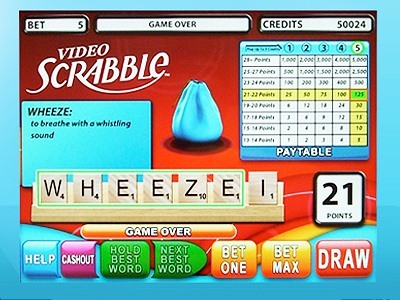 Watch this video of Video SCRABBLE in action. I suppose if it were based on actual skill, there would be a lot of rich SCRABBLE players. But this luck-based game (if you can call it luck), is far from fun. I wouldn't bet my money on this casino machine drawing too much of a crowd. great site! nice game! thank you.